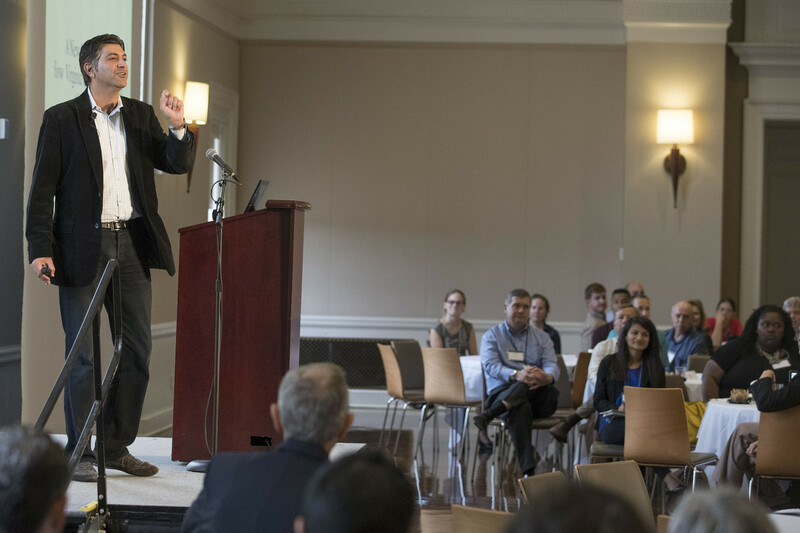 “Datapalooza,” a daylong presentation of data-driven research and initiatives and networking opportunities at the University of Virginia, drew more than 300 attendees Friday to Newcomb Hall and the new space of the Data Science Institute at the Dell 1 Data Science Building. The event featured speakers, panels, presentations – including a Data Visualization as Art exhibit – and a resource fair. Aneesh Chopra, co-founder and executive vice president of Hunch Analytics and the former and first U.S. chief technology officer, presented the morning keynote address. As President Obama’s technology adviser, from 2009 to 2012, Chopra designed the National Wireless Initiative, helped launch Startup America and executed an “open innovation” strategy across the government, built on private sector collaboration. The author of the book, “Innovative State: How New Technologies Can Transform Government,” Chopra discussed how Virginia and the U.S. can tap entrepreneurial problem-solvers – such as data science experts and graduates from UVA – to address challenges in health, energy, education markets and other public and regulated sectors. “I applaud UVA for what it is doing with data use and analytics,” she said, referring to the initiatives and activities at the University driven by the Data Science Institute. She challenged UVA students and faculty and administrators to use their knowledge and resources to tackle some of the biggest problems in our data-heavy society, to ask the right questions, and bring understanding from data as a tool for the betterment of society, while also maintaining security. And Hudson Hollister, executive director of the Data Coalition, the leading industry advocacy group for open data in government, provided an interactive keynote on “Making the World Safe for Data Science.” That session featured work by British artist Nick Gentry, as well as student artists from across a variety of disciplines who use data to visually express information in innovative ways. The Data Science Institute unveiled a new 20-by-9.5-foot “data wall,” where the University community is invited to create art in a virtual reality room using an HTC Vive headset and Google Tilt Brush. This was the second Datapalooza, an event to showcase UVA’s initiatives, data-driven research, resources, services and outreach programs centered around the compilation and analysis of large data sets. The event also served as a networking opportunity for the UVA community and was designed to educate and inform on the issues involving the handling and analysis of massive data sets, and on data-driven activities at the University. The day’s activities included data-research presentations from participants at 10 schools, and six breakout sessions that included UVA and external panelists. It was streamed live to a broad audience, and can be viewed online. Researchers in his group, he said, have collaborated with the Data Science Institute on some proposals, and, more importantly, have served as a resource for answers to ways to best handle data issues. The event was presented by UVA’s Data Science Institute, and co-sponsored by the offices of the Vice President for Research and of the Vice President for Information Technology. The Data Science Institute, established four years ago as a component of a University-wide initiative to focus on key areas of collaborative excellence, is cross-disciplinary, connecting departments and schools, promoting data-driven research and activities, and leveraging the University’s combined capabilities in data science.